Drag & Drop is supported, or use Ctrl-O to open a file. Unless you have to specify the format due to improper file naming, hit Space to start playback (You should need to enter the format once only - it will be remembered). Common shortcuts like LEFT, RIGHT, PageUp, PageDown, Pos1/Home, End work as expected. Press F11 (Ctrl-Shift-F on Mac) to toggle full screen mode, and N to step through color channels. Resize the window as you like with the mouse, or use +/-. Toggle a timecode overlay with T. You can always alter the format (color space, width, height etc.) with Ctrl-F.
You can draw with the right mouse button, enable the Magnifier with the middle mouse button (or M, or with mouse wheel/touch pad scroll) and drop a bitmap to wherever you like (a skype chat for instance) with the left mouse button. You can also hit Ctrl-C to copy a frame as bitmap, or Ctrl-SHIFT-S to save it. Clear a drawing with double click or DEL, enable advanced deinterlacing wit I. If you drag two files onto a vooya window, you will see the difference. If you drop a file onto vooya (playing another file) holding SHIFT, again you will get the difference. More files will open more player instances. If you drag a frame from vooya onto another vooya, that latter one will play the difference. You can load multiple files at once, opening multiple player instances. As a special case, if you open two files at once, the difference mode will be enabled. Note that you can also simply drag files over the playing area and drop them there with the same results. Reload the file and update the frame count. The current seeking position is maintained if possible. Closes the current file and displays the startup panel. opens a new vooya instance. Tries to open the containing directory. copies the current	frame (including timestamp overlays and drawing annotations) to the clipboard. Note that you can also drag a frame with the mouse off the display into a folder or something that accepts bitmap clipboard data. Save a frame as image (PNG, JPG, TIF or BMP) to a user-specified folder. On the bottom of the file menu, a list of recently used sequences should be displayed. Display the video at greater or smaller size. Using "+" and "-", you can also do this with keyboard shortcuts, or even resize the window with the mouse, as usual. 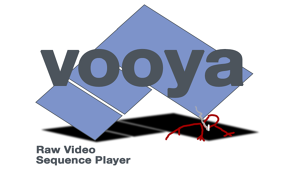 Toggle: (a) Fit video display size to current window size and let video scale with window size or (b) leave window size untouched and scale video inside vooya. Reset video size to 100% (if possible; on smaller screens, Fit To Window must be OFF for that). Upon resizing the window, the video can be set to maintain its actual aspect ratio. As it tells, enables fullscreen mode. Display a time code on the bottom left corner of every frame. This includes the frame number and the current time stamp based on the FPS given in the format dialog, in the format mm'ss''ms. Cycle through the color channels (N). The order of channels depends on the current color format. Measure the achieved frames per second in Herz. The result is displayed on the bottom left where timestamps are displayed (if timestamps are enabled). As it says, keeps the window on top of all others. Useful if you need a video reference while programming in Visual Studio, XCode, Emacs, où que ce soit. Open up a console terminal that can be used by plugins to output additional text information. Show a magnifying rectangle around the pointer, showing the current position and the respective values of all color channels. Turn on (high quality!) deinterlacing. The frame rate is halved. changes the	file name into something every yuv player should understand. Note however that vooya remembers the format you specify. Opens a dialog where you can create a new sequence from a range of frames. Allows to reverse the current sequence, giving you a new one. Opens a toolbar where you can adjust brightness, contrast and gamma, e.g. for better examining coding artefacts. Exit with ESC. Settings can be stored for later use. The Exposure slider enables you to see color content of HDR images with higher bit depth on your regular 8bit display. opens a histogram. There, a context menu gives you some export options. Exit with ESC. For most formats data up to 16bits is supported. This generic approach yields hundreds of possible combinations. vooya supports skipping header bytes at the beginning of a file. Videos can be marked flipped, indicating that they should be played upside-down. Note that vooya supports various input formats, whereas its output is currently limited to the OS's output bit depth and color space, i.e. 8bit RGB. To avoid entering formats every time, it is convenient to name raw data files appropriately. A file name vooya can handle should at least contain the video's resolution, e.g. with frame rate and count in a >VIDEO< section, and resolution, color channel count and x/y chroma subsampling in an image header. There was also a version for RGB data, but I don't remember how that one worked - presumably similar. MSE, and PSNR are calculated as described in Wikipedia. SSIM calculation follows the proposals in the publication of Zhou Wang et al., with non-overlapping 8x8 windows and 8x8 Gaussian filtering @1.5 standard deviation.